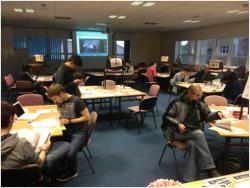 Masters students from Bangor University’s School of Psychology organised a university-wide letter writing campaign for Amnesty International’s (AI) “Write for Rights” campaign. Each year AI chooses a set of 15 cases from around the world and asks people to write letters of support and because people from all over the world write to support the cases, each one receives hundreds or thousands of letters. Receiving such a massive show of support makes it difficult for oppression to continue unnoticed and each year the letter writing campaign leads to the release of several of the individuals it aims to support so makes a real difference to the lives of these individuals and sometimes the future of their countries. 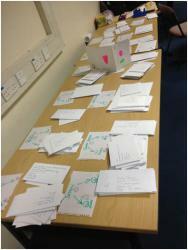 Over 40 Bangor students came to write letters, writing over 160 letters, which were sent out before Christmas. Dr James Intriligator, Senior Lecturer at the School of Psychology says “it was impressive to see such a show of support from the Bangor community and we hope that this will become an annual event at Bangor – and we are working on making this a pan-Wales event.” The local event was organised and supported by masters’ students (led by James Gudgeon), the student Amnesty International Group (run by Martyn Curzey), and the Bangor Photographic society donated hand-made photo cards (chaired by Pippa Beston).